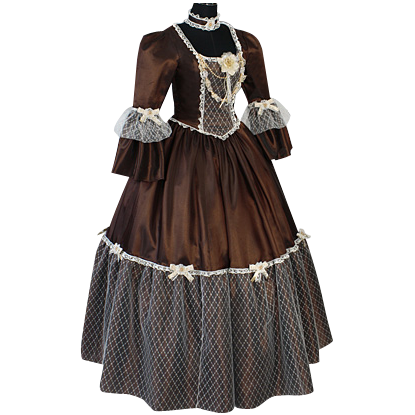 The Catherine Victorian Style Dress is an absolutely gorgeous Victorian-era gown made from high-quality taffeta, it features beautiful lace trim and ornamentation, and fastens via laces in the back, ensuring that the dress is highly adjustable. This elegant one-piece dress is made from taffeta, which ensures that the dress has a silken look and feel that lends to a noble, rich appearance. The dress features a generous amount of attractive lace trim along the bodice, waist, skirt, and sleeves. The bodice also features a detachable lace flower, as well as a hanging, necklace-styled pearl and crystal decoration that only adds to the feminine beauty of this dress. The flared sleeves are half-length and feature lace and flower-styled designs that prevalent throughout the dress. The lace trim on the skirt is additionally decorated with pearls, lace, and ribbon flowers, matching the decorations that occur on the sleeves. The design of the bodice incorporates an additional layer of fabric, as well as boning, to ensure that the material is always smooth and creates the ideal shape. 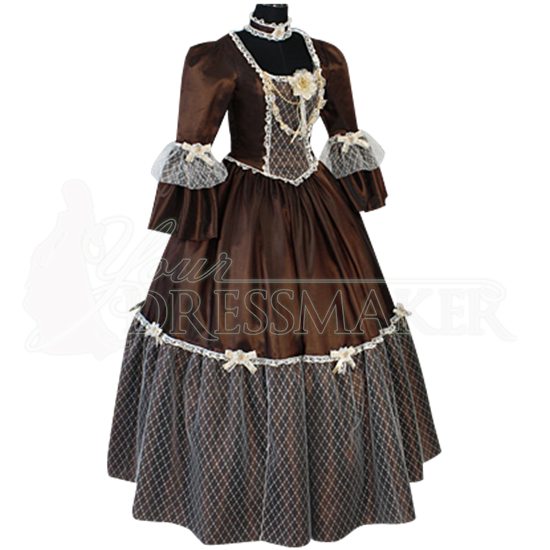 The Catherine Victorian Style Dress comes in a variety of beautiful colors and sizes, given that this dress is quite adjustable, that means that there is a color and size to fit any woman's personal preferences. A beautiful choker necklace with pearl and lace-ribbon ornamentation is included with this dress. 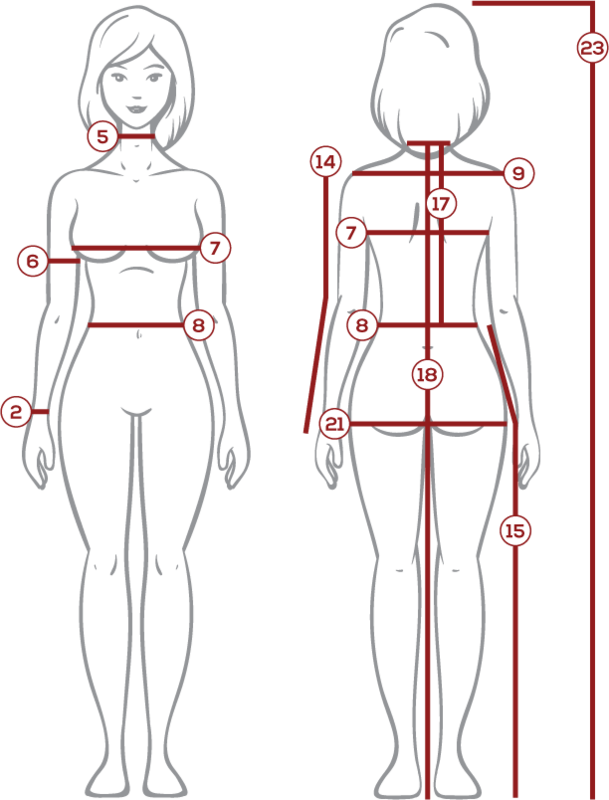 A hoop skirt was used in the picture above to give the dress additional shape and form, although the dress does not include one, the dress can be worn without, or if desired, a hoop skirt or petticoat can be purchased separately to give this dress your preferred shape. There is likely not a woman alive who wouldn't look absolutely stunning in the Catherine Victorian Style Dress, it will transform a woman into a radiant beauty that will leave the crowds awed and dazzled.